Fabulous 5th Grade Fun: I Got Boo~ed! It couldn't have come at a better time! What a crazy month! I was super excited to find my surprise hanging on my door early this morning. Which means, someone got there earlier than I did! Wow! 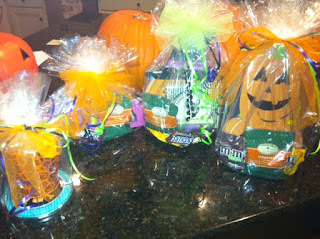 If you aren't familiar with "Getting Boo-ed" just Google it or look on Pinterest. Totally different from being virtually boo~ed. I got a super cute gift waiting by my classroom door. Two other teachers and I were going to start it, but someone beat us to it! Even better! What a great way to boost the spirit around school! It's the little stuff. After school, I went to Target, to find my cute stuff to pass on the BOO! All from Target! So many cute things! 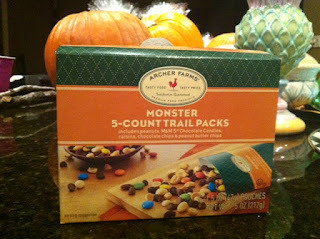 Had to add this...Monster Trail Mix...Really?!!! How perfect is that for Halloween? Tomorrow, is our school carnival. The fifth grade team will dress as Mad Scientists! Every grade level will parade down the halls of the school showing off their costumes. Right after school, we hold the biggest fundraiser ever! The Fall Carnival! Ahh, the tricks that I will have up my sleeve to maintain control! Actually, I have some really fun stuff planned. Stay tuned. If they work, I'll share. Side note ~~~ I'm really excited to attend the TCEA Region 20 Google Summit this weekend. If you live in the San Antonio, or surrounding area, you should attend. It is FREE! Here is the information. Can't wait to share what I have learned. Back to being Boo~ed...have you done any fun things right before Christmas? Looking for ideas.